The alternative to the basic conflict plot is one that does not require an arresting change in circumstances. This method has been used for centuries by Chinese and Japanese writers and is known as kishōtenketsu. It is a more thoughtful approach in many respects. Let’s take a closer look at these comics examples. The first one demonstrates the Western approach: You have conflict and you must confront it in order to get what you want. 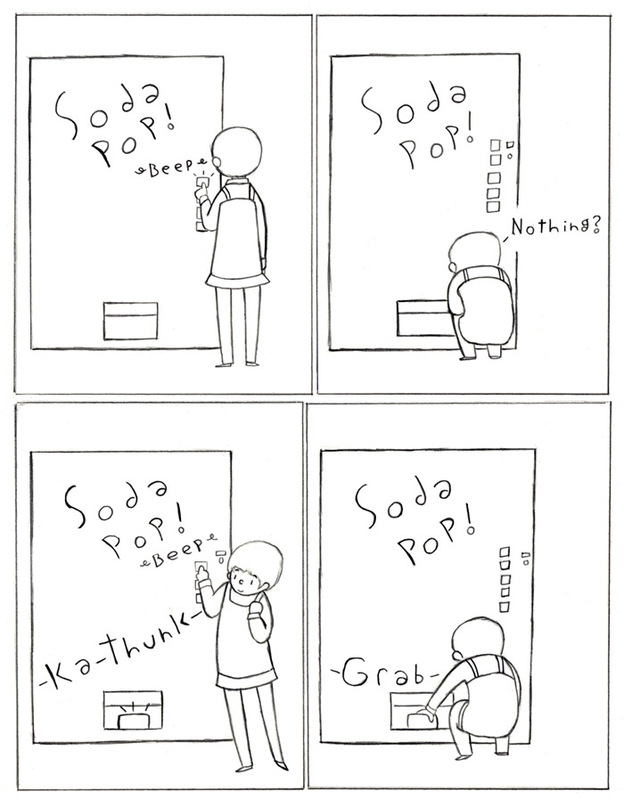 The soda machine is not responding. That’s your conflict. Finally, it works and you have your resolution. The second one demonstrates the Eastern apporach: Here you have a more natural flow to storytelling that deals with a twist and has an amicable resolution. By the third act, the reader is presented with a twist, the presentation of a new character. In the end, the twist leads to a restoration of order, and a pleasant ending. And so we have this alternative view and one that can apply to all aspects of life. You don’t think so? Well, consider how influential thinkers pull the levers of power. It was such a force as Jacques Derrida that insisted that all things in life must reach a conflict and be resolved. The strong will impose their agenda on the weak, and so on. You can follow this train of thought further in a wonderful essay on the virtues of kishōtenketsu over at our friends at Still Eating Oranges right here.